Ben White, seen here as a member of the Quinte Red Devils. Submitted photo. Ben White was hanging out with his brothers in the basement of his Napanee home on Saturday, trying to keep busy while Ontario Hockey League teams announced their picks during the league’s Priority Selection draft. 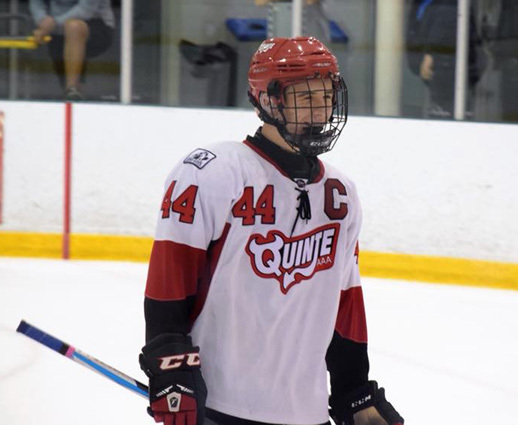 Unlike some players nervously refreshing the online draft page, the 15-year-old Quinte Red Devil forward wasn’t intently following along online when the Erie Otters selected him 126th overall in the seventh round. By the time he answered the phone however, the other members of the house had already seen his name get called. “I got a phone call and as I picked up the phone I heard my mom screaming,” said White. On the other end of the phone was a representative from the Otters informing him he had in fact been drafted to the OHL. This isn’t the first time the White family has received a call from an OHL team, as two years earlier his brother Logan was selected in the 11th round by the Kingston Frontenacs. White will now gear up for a busy summer, first attending a prospect camp in Pennsylvania and then some on ice testing followed by an invitation to their main camp as he attempts to make the team. White first learned the game of hockey as a member of the Napanee Stars before moving up to AAA with Quinte for the past five seasons. He served as captain for the Minor Midget Devils this past season, picking up 11 goals and 19 assists in 36 regular season games. In the playoffs he added two goals and four assists in nine games.